When a religion goes global it is faced with some surprising challenges, especially if it insists on the rigid adherence and fossilized interpretation of its rituals (as is often the case). Just look at medieval Icelanders. In the year 1000 their parliament adopted Christianity as their national religion. Soon they were faced with a serious problem. Communion wine was very expensive and often not available at all. Icelanders could not possibly grow their own grapes so close to the Arctic Circle. And as much as they were audacious sailors, bringing barrels of wine in their open boats across the stormy North Atlantic wasn’t reliable enough. 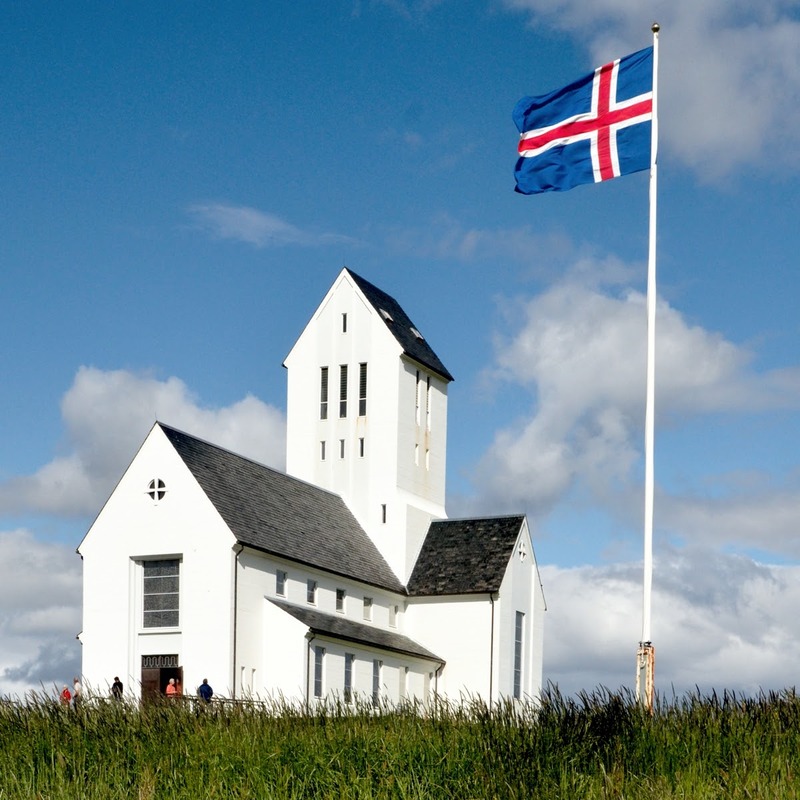 Resourceful Icelanders came up with a simple solution - they started to brew their local berries or substituted mead for wine. An ingenious solution perhaps, but it was soon banned directly from Rome. Communion was to be served only with wine, and the wine made from grapes. Sometimes it feels like wine growers had a really powerful lobby in Rome. Protestant missionaries had similar problems all over the tropics. Grapes do not grow in the arctic and subarctic regions but they do not grow particularly well in the tropics either. Grape vines need a cold dormant season. In the tropics a vine grows plenty of leaves, alright, but hardly any harvestable grapes. And in addition to wine problems, the tropics presented also a problem with the bread. Before the arrival of missionaries it was virtually an unknown food. In the tropics, yeast is unpredictable and hard to work with and after bread is baked, it spoils really fast. Roman Catholics had their communion wafers, while Protestants kept on baking and serving strange approximations of wheat breads. Could it be that bakers had a similarly powerful lobby among Protestants? These are unfortunate examples of rigid ritualism, textual fundamentalism and lost opportunities to translate Christian faith to the climates, and into the lives and cultures of the peoples around the world. Thankfully these attitudes have been changing in the last few decades. I came across long, and learned tracts discussing with all sincerity the use of wafers in protestant worship and sometime even the use of other juices of other berries, as long as they are red. (As if the color was so important!) Some theologians are slowly recognizing that wine and bread are staple foods of the Mediterranean region while other cultures have their own staple foods. And as is often the case, these other staple foods and drinks also have their deeper symbolical meanings; cocoa in Mesoamerica, ‘awa or poi in Polynesia, tea or mochi in Japan to mention only some. Many of these foods and drinks (and their symbolisms) are well suited to be adopted and to help translate the deeper meaning of Holy Communion. 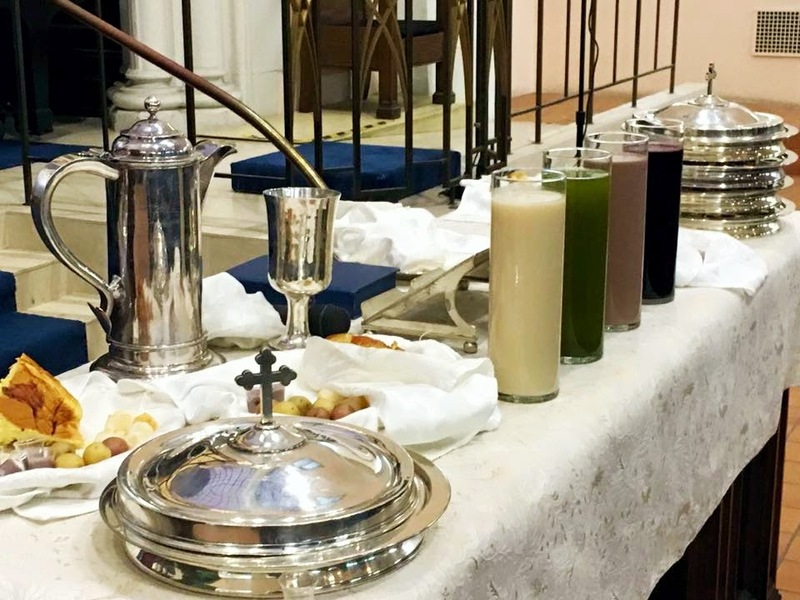 This World Communion Sunday we will take Holy Communion global. So come this Sunday, taste and see that the Lord is good, God’s love endures forever and permeates the entire world (not only the Mediterranean corner of the world). with grape juice, but also with coconut milk, green tea and cacao. Can Jews, Christians and Muslims live in peace with one another without prejudice and hatred? Can people of different religions and confessions coexist? We are not the first ones who ask this question. While we ponder this question with fear and anxiety, there was a time when people asked it with anticipation and hope. The first church which I served right after my ordination was founded in 1785 and in its old sanctuary (it had two sanctuaries!) was an altar with this Latin dedication (shown here on the picture) to the Holy Trinity and with respectful thanks to the Emperor Joseph II and his successor Francis I. My predecessors were not a bunch of sly toadies. 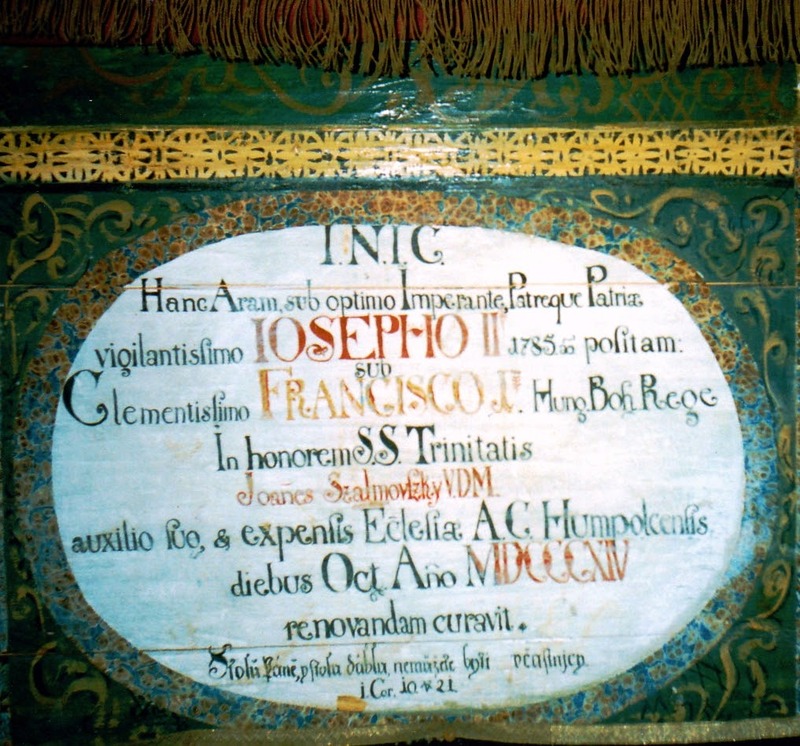 They were genuinely thankful to Joseph II, the exemplary Enlightened Monarch. After dark centuries of religious persecution, the Enlightenment finally brought reason to the matters of religion, and with it eventually came the long overdue freedom of religion and the freedom of individual conscience. Today, the seductive sirens of religious, cultural, racial and national intolerance and chauvinism grow ever louder and stronger. It is good to remember the ethos of the Enlightenment, this formative intellectual, cultural and spiritual movement. On this side of the Atlantic, the Enlightenment stood at the cradle of the United States, her Constitution, and the Bill of Rights. In Europe the Enlightenment grew up from the dark centuries of religious intolerance and wars and presented alternatives of reason, tolerance and peaceful coexistence. I rejoiced when Chris Jones offered to perform in our church a pivotal excerpt from the play “Nathan the Wise”. When Gotthold Ephraim Lessing wrote it, it was so radical, that the official church made sure it was never performed during his lifetime and the book was put on the index of prohibited books. Why? Because it advocated for religious perspectivism and tolerance - the conviction that Judaism, Christianity and Islam complement each other. This Sunday is our Homecoming, we enter our new program year with the hopeful message of Enlightenment and Tolerance. This weekend we will welcome to Rutgers the published author and poet Susan Brind Morrow. She will bring to us her love and deep interest in Egyptian Hieroglyphs and more specifically the Pyramid Texts. In the Bible and our Judeo-Christian tradition Egypt does not have good reputation. The Torah (the Law) specifically branded Egypt inseparably in the phrase “the land of Egypt, the house of slavery”. It is a clear moral, political and religious judgement. The law and prophets admonish contemporaries as well as all the descendants (including us) never to return to Egypt. Why then to do it, against the explicit biblical warning? Firstly, for two months in the series on Forgotten Religion we did something like that. We checked and revisited the truth and validity of the assumed postulates of our faith tradition. Secondly, and more importantly, according to the most recent scholarship there is a two thousand year difference between the Egypt of the Bible and to the Egypt of the Pyramid Texts. This is roughly as large a difference as between some current fundamentalist megachurch and the band of Jesus’ disciples. We do not dismiss Jesus, his ministry and his teaching because of some distant corruption of his teaching. To the contrary we go and search diligently for his true ethos and his deep insights. 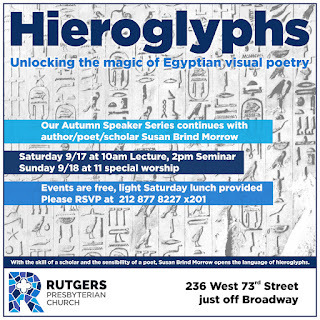 And that is what we want to do this weekend with ancient Egyptian texts. Susan Brind Morrow recasts the Pyramid Texts as an important religious poem, arguing that these immaculate engravings describe not only a foundational religion and philosophy but a radical way of viewing the world. This is clearly not a regular clock. But it has the power to open our minds to new perceptions of time and even can become a real time machine allowing us to travel in time. Or more accurately, it can help us to experience time in different way than we are used to. 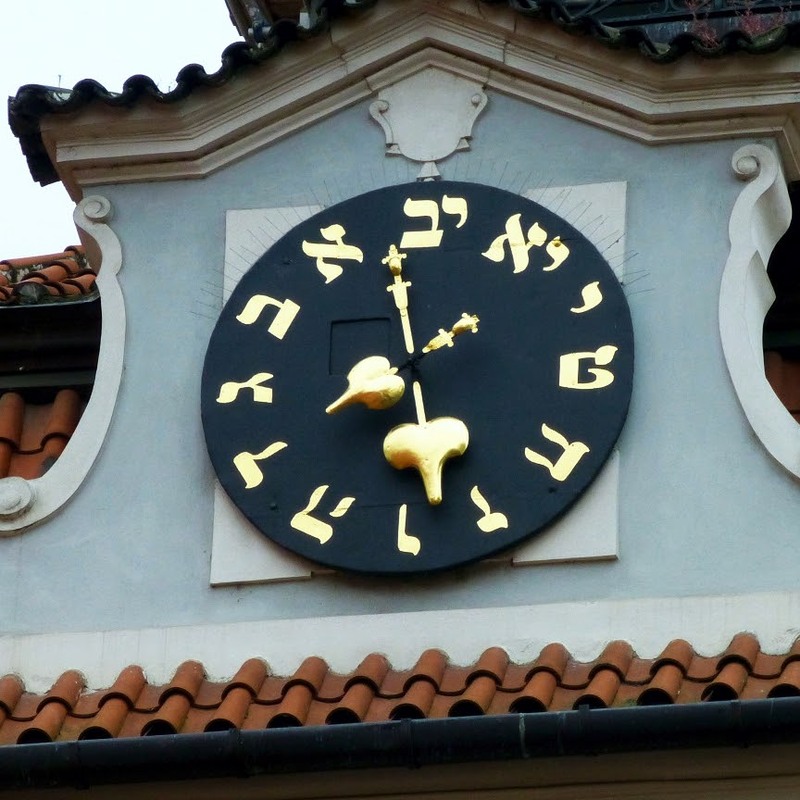 This special clock is in Prague on the medieval Jewish City Hall. (It is a different clock from that more famous astrological clock with figures of apostles, which is on the Old Town City Hall.) Hours on this clock are marked in Hebrew letters: Alef for one o’clock, Beth for two etc. And thus this clock shows time in counterclockwise manner, if you wish, backwards thus mimicking the Hebrew way of writing and reading from right to left. If you feel a little dizzy, know that it is intentional. Far from showing backwardness, this clock is in fact a very clever mental tool shaking us up from our settled ways and opening our minds to new perceptions of time. For instance in Hebrew the word for the past QEDEM means not only “the East” but also “that what lies ahead” and the word for the future ACHARIT means “behind ones’ back”. Clearly, in the not so distant past people were differently oriented in time. Past was before them and future behind and it was so not only in Hebrew language. There are vestiges of this orientation even in today’s English. We still speak about day before yesterday or day after tomorrow and our “ancestors” are literally (from Latin) those who “went before us”. Time machine on the Jewish City Hall in Prague cannot move us to different epochs but it can visualize for us the magic of time and open our minds to new possibilities in our orientation in and perception of time. 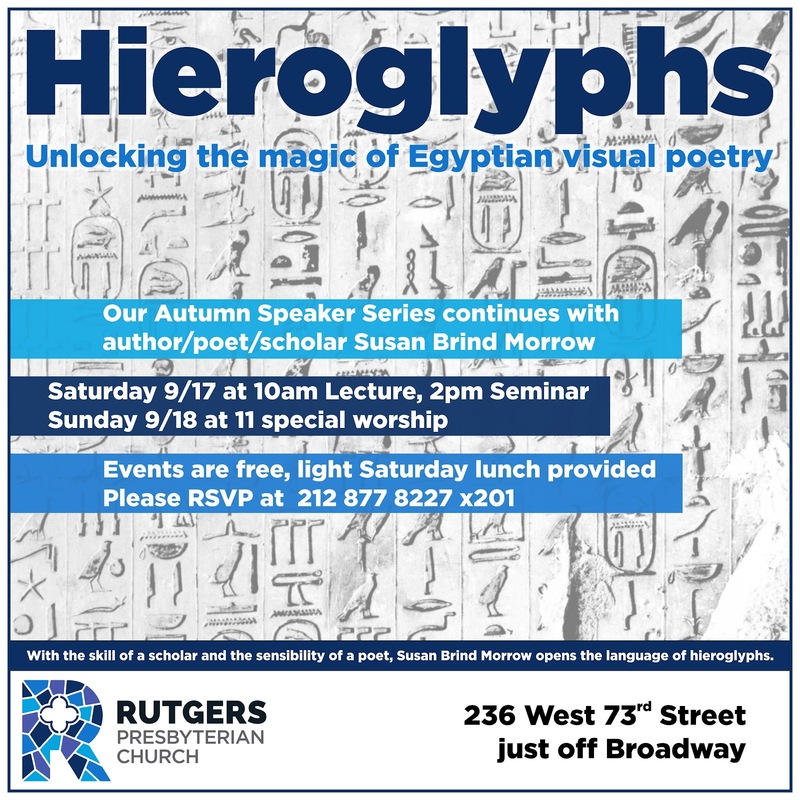 As we conclude this Sunday our quest for forgotten religion, we will immerse ourselves in this magic of time and the role of ancestors in our religion.